Successful tactical missions begin with effective training. 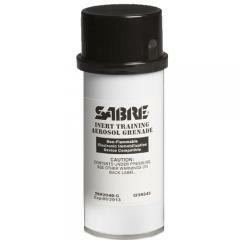 The 5.0 oz Inert Training Aerosol Grenade from Sabre is a safe, effective and realistic way for operatives to prepare for life threating situations. Featuring the exact same dimensions and specs as its live counterpart, the inert training unit completely empties at an impressive speed of only 14 seconds. The inactive formula fills 22,000 cubic feet in only 60 seconds, marking inhabitants for easy identification without actually harming them. This allows trainees to become familiar with the Aerosol Grenade's performance and function w/out having to harm partners or wasting materials.